I'll be signing up for membership, and promise to continue sending the love your site's way on our blog. I've already mentioned to them that we are signing up because it's so fabulous. Hopefully that will increase membership among the homeschooling crowd. I just joined dadcando. I had been looking at the awesome projects on your site yesterday and decided to join because you have so many projects, but also because of the quality. So many projects you find [on other sites] are what seem to me to be throw away projects, fun to make at the time but not something of quality to keep and cherish.
. . . I’m not a single dad, I am not even a guy, I am a Grandma. I raised my kids as a single mom, and I know from that side of the fence just how it hurts for kids to be without a father (at least one that is in their lives). So I cheer your efforts and goals here on this site.
. . . I would love to share the projects you offer with some pretty great kids who would seriously enjoy them. I want to say that you are doing some brilliant work with the web-site. As a father of three, divorced (and separated just over four years ago) it really is very hard to manage work, relationships with your children and strike a balance between just being a Dad and doing fun stuff that is entertaining and engaging when you have them one day each week.
. . . The creativity and commitment you demonstrate through your site, I find, is inspirational - I'm amazed at the ideas that you just keep coming up with. If I had had access to the information you provide, (and not just the project ideas) at the time of my separation, I'm certain that I may have approached some things differently and better for myself. Clearly you are writing from experience. Exactly right for single fathers [and the rest of us], especially when TV, football and McDonalds has been the only options. I am a grandmother of two grandsons and the cool activities on your site have blown me away and helped my boys bond with me in such a way that French knitting and Scrabble never did. My thanks to you for an impressive, award deserving site. Love what you are doing on the website. We need more people exercising their imaginations as you have been doing. You make a great role model for creative thinking and problem solving. I found your site and was impressed by both the simplicity and the amazing results of your projects.
. . . Your message is wonderful, and it is refreshing to see such a positive approach to such a delicate situation. In today's environment of video games and text messaging, I also appreciate how your projects emphasize hands-on experience and imagination.
. . . Thanks for maintaining such a wonderful website. I currently don't have any children, but I have several nieces and nephews who will be getting some imagination-inspiring birthday presents in the coming year. I just found this site tonight and I am SOOO glad to be here, I just had to tell you. While I may not be a single dad, as a mom with substantial amount of help from my husband with our 4 yr old daughter, sites like these are what makes parenting a BLAST! Not only that, but there are many great gifts for other adults. What really got me going though, and turned my "ooh what a great site" into "wow, that's so cool!" was the Mad Eye House Picture. Hubby and I are huge fans of the show. I can't wait to do more stuff from dadcando! I have a very small private school in my home. I operate on the shortest of shoestrings. I can't tell you how grateful I am to you for offering these lovely projects. 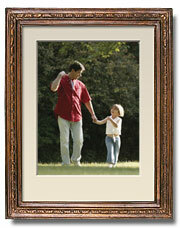 The quality is superb and as you point out, children value that greatly. We will be greatly enriched by them.
. . . I have downloaded many of your templates. We will be making them slowly, but as we do I will be sure to upload pictures of some of the finished ones.
. . . Thank you again, so much. Keep up the dragon projects. I really love them, mainly because I love dragons. And I think your dragon projects are just superb! Especially the new egg, I have been meaning to make a dragon egg, but I haven't been able to find time to do so. Which is a pity, because the Filigree egg case is a work of art! Thanks. I have spent about half an hour this morning looking over the site. It's great. While there seems to be a lot out there for mom's, there isn't much for dads. My boy will love doing some of these projects. This is the most wonderful website. I have been searching the web for things to make with the children at my nursery school in South Africa and this site is absolutely perfect. It's easy to find your way around the site and the ideas are brilliant!
. . . I will be checking for new creations with great anticipation and excitement. This is a PHENOMENAL website! I myself am a 23 yo female, and my mother passed away many years ago. Before then, however, she and I used to do many projects together. After she had passed, I did some projects with my dad. I think it's so great that a website like this exists for other families out there to enjoy spending time together. I know I would have liked this website to be available to me when I was younger. 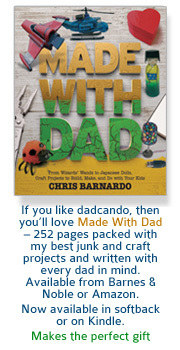 It's also so wonderful that you don't HAVE to be just a dad crafting with your kids- I myself do many of the projects on this site with my 20-something friends! Additionally, I frequent instructables.com and also appreciate your contributions on that site as well.
. . . So anyway, I wanted to just let you know that you are continuing to do a great job. I love your website and everything it stands for, and I wish you and your family a happy and healthy week! God Bless! Hi, my partner of one year is a separated dad with two beautiful children who live with us for half the week. Things are challenging quite a lot of the time, trying to support the kids and deal with the whole new two houses and two families scenario. I started searching for help online this morning because my heart is breaking for my partner who sees his children gravitating away from him and he feels so useless at times because a 'dad' is never a 'mum'. Your website has filled me with hope and good ideas and I LOVE the gorgeous inspiring pics on every page of cartoon superdads! It's so uplifting! thanks so much guys and gals - this website is amazing. from a very resilient lass who is trying to convince her partner that he is and can continue to be a fabulously wonderful dad!!! It's not often I feel compelled to leave feedback on a site - but stumbling across this site made my day, so I thought it was the least I could do.
. . . I'm 18, not a dad yet. But still - the projects listed on this site are great fun to browse through and read over :) As far as the projects and instructions go - it seems like the perfect site for me. But I love that I'm not actually the intended audience.
. . . How awesome it would be if more dads took time to spend with their kids! I'm only 18, right? So I'm sure I'm only just BEGINNING to understand the huge influence my dad has had on me and will have on me as I go (and grow) through life.
. . . Keep it up. Hi everyone, I Love the site, I have two girls and we like to make stuff together, (My oldest is in a wizard rock Harry Potter band so when she sees all the stuff we can make she is going to flip and Madeye is my fave) Plan to be here often. What a fantastic website. I'm so impressed with everything here. I'm incredibly lucky to be happily married with two wonderful children, but due to illness, I can't do all the usual "dad stuff" like playing football, running around, etc. etc., but there are so many other things I have found to do with them, thanks to your wonderful site. I've just made the Concorde and Tornado paper planes for them (they fly superbly, by the way - good instructions! ), and together we will work our way through the rest of your site. Words cannot describe what a stunningly good resource you have made! Wonderful, wonderful site - thank you so much for all the downloads - it's going to be a fun summer! Hi! I followed a tutorial on how to make wizard wands and my eldest niece and I made some for an awesome Harry Potter Halloween decoration. I also made a few for some Harry Potter Swaps. Thanks so much! Hi there! I think this site is amazing! I just made my own wand, and it is wonderful! I'll do the snitch next weekend. Just wanted to say: really awesome work of you! Thanks for the inspiration for making dragon's eggs. My daughter is a dragon collector and budding artist, and we also have a family tradition of decorating Easter eggs in unconventional ways, so this was a fun project. Thanks also for the very cool antique mailing box template that added the perfect accessory for the egg! Hello, I’m a mum of 5 children and I came across your site while looking for a reward chart to print out for my youngest son. I've just spent the last 3 hours here and I just couldn’t leave without saying, well done, this is a wonderful website. Hi there, I just wanted to say I think you‘ve put together a brilliant site. I saw your space rocket mentioned in today‘s Guardian and thought I‘d have a look, even though I‘m a single mum rather than a dad. Hope you don’t mind. I hope you don’t mind a mother writing to you only I would like to say that I am impressed with your website and very glad to see that some dads want to continue to take an active role in their kids lives. Just because the parents are no longer together this should not affect the relationship between a dad and his kids. Anyway keep up the good work and continue to highlight your website in the press, it may help a lot of kids. I wish you every success. I just wanted to congratulate you on this lovely site and to say that I’ve passed on the link to our Members. Mothers Apart from Their Children has offered non-judgemental emotional support since 1979 to mothers who are apart because children have been fostered, adopted or abducted abroad. Most Members, however, are apart from their children because of high-conflict family breakdown when the child chooses of their free will not to see their mother. Best wishes, and thank you for what you’re doing for children. Great site, good to see you advocating doing ordinary activities and encouraging dads to invite their children’s friends over etc. I want to say, this is the best site I’ve come across in years. My husband is a wonderful devoted dad, and it’s hard for him to find resources just for Dads. This site is amazing. It is so nice to see a site recognizing the importance of DADDYS in kids’ lives. The wonderful activities and ideas will keep him busy with fun things for just him and the kids. They love their “Daddy Time”. 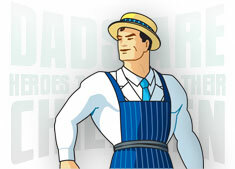 Way to go Dads.... I’m so glad my husband finally has a site that’s HIS, for ideas and things to try out with the kids! There needs to be more sites like this. Click on the dart below to tell us about your tip or the things you do, or just leave a message. You can support us by linking to this site and telling other dads you know, about the useful things you’ve found here.